Online Registration for 2019 is now open so click HERE to take you to the Log-In page. View the paper 2019 registration form by clicking HERE, but the best way to ensure your child a spot in the league is to register On-Line!!! In-Person registration will be on February 9th from 1:00pm-4:00pm at Bedford Public Library. Registration fees include a Complete Player Uniform (jersey with name and number, pants, belt and hat), a (16) game schedule (8 games for Rookie) and team equipment such as Batting Helmets, Catcher's Equipment and Baseballs. Players will only need a baseball mitt, cleats (preferred, but tennis shoes are allowed) and bat (although many teams allow players to share bats.) Based on the Division and how the team finishes, Pre and/or Post Season Tournaments may also be included. Also, all players will receive $5 raffle tickets totaling the amount of their registration fee (i.e. Pee Wee = $170; which would be 34 x $5 tickets.) These tickets can be sold and the money kept by the parent(s), so the player could play for free; or parent(s) can keep the tickets, write their own name in and try to win one of the cash prizes ($1000, $300, $200). Basically, if you choose to sell your raffle tickets, your child gets to play baseball for FREE! Changes from 2018 rules are highlighted in RED! Keep in mind, 3B follows National Federation of High School (NFHS) rules in situations not covered under the 3B General or Division Rules. The State of Michigan, in 2013, voted into law, sports concussion legislation. This law requires all coaches, employees, volunteers, and other adults involved with a youth athletic activity to complete a concussion awareness on-line training program, which must be re-taken every three years, or more frequently as determined by DHHS. Click HERE to go to the Michigan Department of Health and Human Services web page to get more information. Click HERE for the Center for Disease Control's Concussion Information sheet. Click HERE to go to the National Federation of State High School Associations Concussion Training Site. Both training sites are free and expect to spend 30 minutes to achieve your certificate. Save, print and hand your certificate in to your coach, Division Director or mail to the 3B office. New for the 2018-2019 Season! 3B is starting its own "Travel Baseball Program" called Bedford Elite. This program initially launching with 12U and 14U teams, will fall under the 3B umbrella and will focus on providing selected 3B players with a higher level of competition and more games, with the same quality, safety, support and reliability 3B families have come to expect over the past 50+ years. More details will be coming soon, so keep an eye out. In the meatime, feel free to reach out to Travel Director, Tim Hunter by clicking HERE. 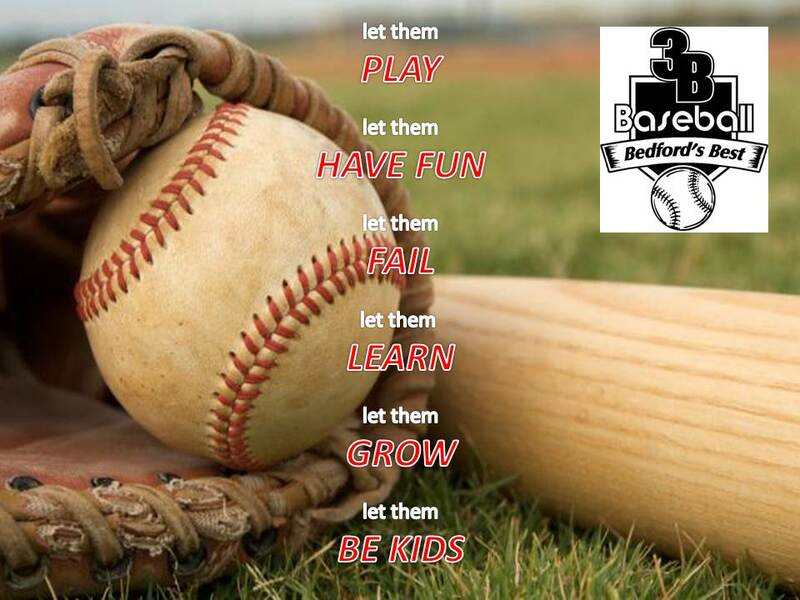 3B Baseball is a non-profit baseball program and has been serving youth and adult players of SE Michigan and NW Ohio, ages 5 and up, for over 50 years. Along with recreational divisions, 3B's All Star teams have experienced great local and regional success. 3B is now also proud to offer a 18+ league for adults still wanting to play hardball. 3B is a co-ed league and the divisions are divided by player age, as of May 1st of the current year. With just a few exceptions, all games are played at White Park (6 fields) in Temperance, Michigan. Practices begin the first week of April, or sooner, depending on weather. Your coach will contact you with practice days and times. Games begin around the first week of May. Come back to the website for more details and updates. Good sportsmanship, participation and player development are stressed at all levels of baseball in 3B. Siblings and/or friends can play on the same team, but sponsorship restrictions apply. For more information on each division (including details on cost and basic rules), please hover over "League Information & Rules" in the top banner and select the appropriate Division (by player age). If your player is too young to participate in 3B Baseball, or if 3B isn't the right organization for you and your family, please take the time to visit our friends at Bedford Community Education. Community Education offers three different programs for kids aged 3 1/2 years-old to 2nd grade. Their registration is later than 3B, so if you've missed our registration, Community Education might still be available. You can visit Community Education's website by clicking HERE. Starting in 2017, the Farm, Pee Wee, Minor and Colt Divisions will all follow a standard draft process. Please review the following document for the draft rules. Here is a visual representation of the draft. The shaded cells in the picture indicate the number of players on the roster at the start of the draft. This is just an example. Click on the link below for the draft visualization.